This past weekend I went NUTS sketching in a 12 hour binge. 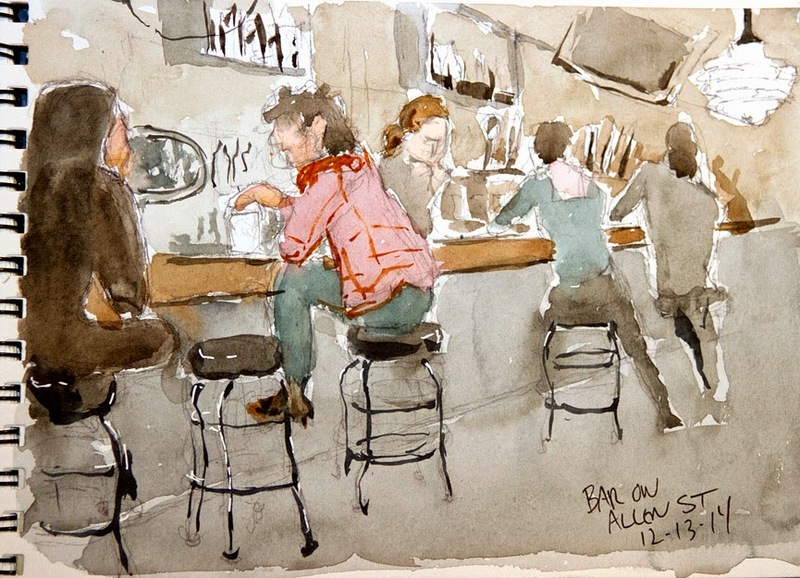 Maybe it was the inspiration from the NYC Urban Sketchers. Maybe it was the mystical consecutive gematria of 12-13-14 (If you are into Kaballah you understand). Anyway here is the chronology of my day, which began at 9 AM with a warm-up on the 6 Train downtown. 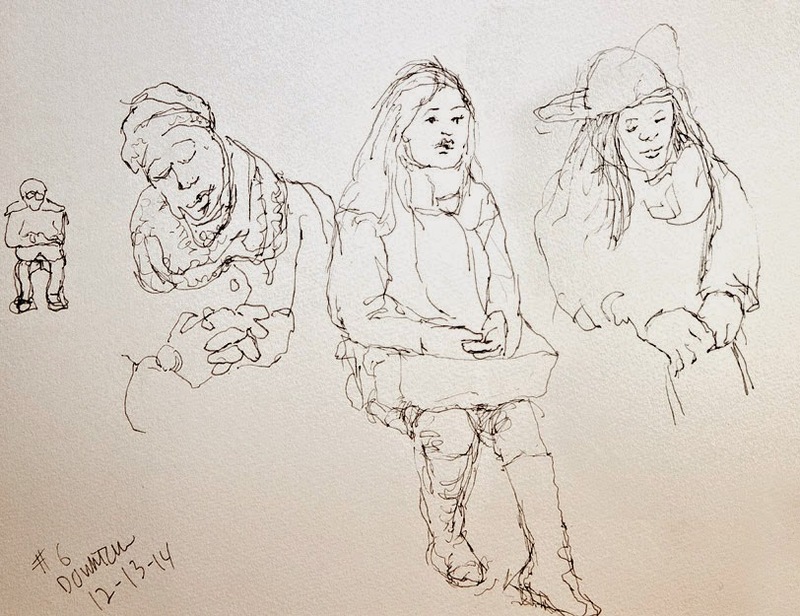 The Urban Sketchers met in the Winter Garden next to Ground Zero in the World Financial Center. 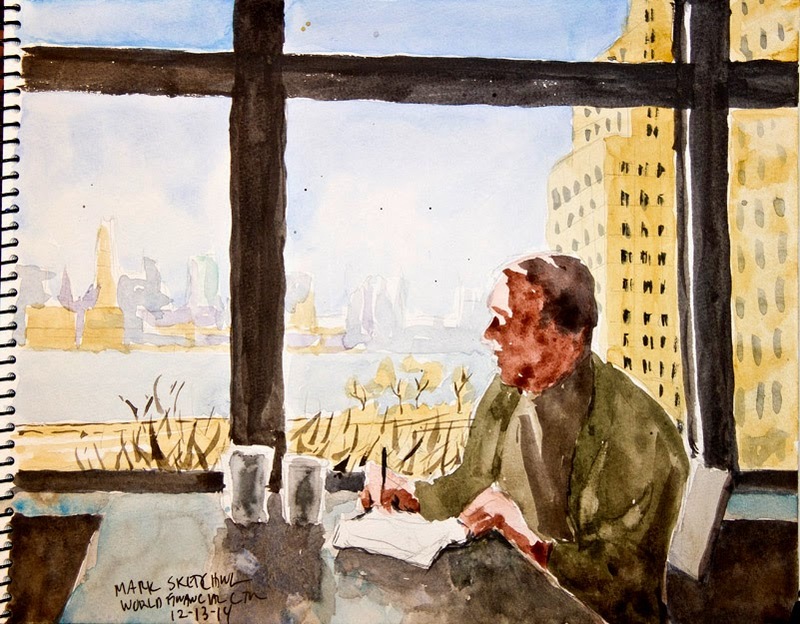 I used my watercolors to paint Mark sketching, overlooking the Hudson River and my old hometown Jersey City. After lunch I painted Yolanda, a new member of the group. The light from the huge windows gave her beautiful skin a glow that I tried to capture. Then I went scouting for a new Urban Sketch location in the ultra-hip Lower East Side. I went to a bar and and ordered a beer and took out my paints once again. This one was challenging because this place was dark and I winged it with the colors. The guy in the maroon jacket was doing a great job chatting up the Asian lady on the left. I couldn't stop sketching. 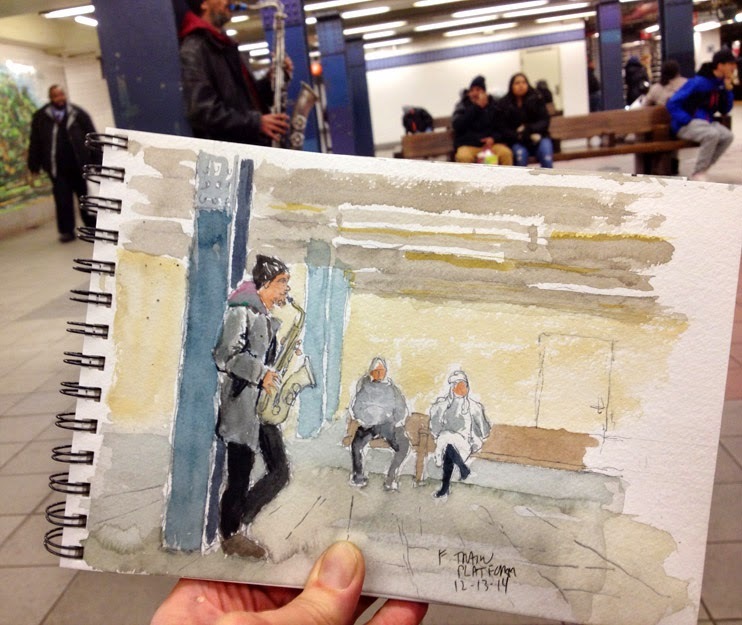 On my way home I sketched this down-on-his-luck sax player on the F Train platform. 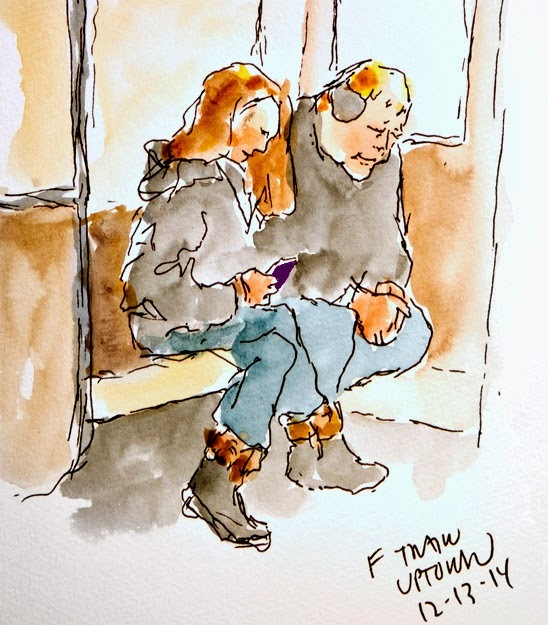 Coming back on the F Train I sketched this inebriated couple. 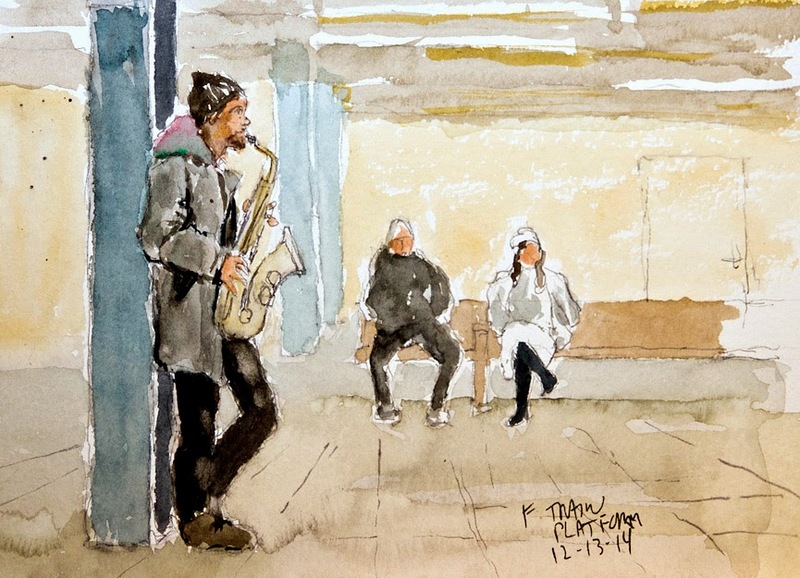 I used a waterbrush to get the color in while on the moving train. By this time it was past 9 PM and the day was getting long. This was a 12 hour sketch binge! Anyway I hope you enjoyed looking at my day in the great city of Manhattan through my sketches! 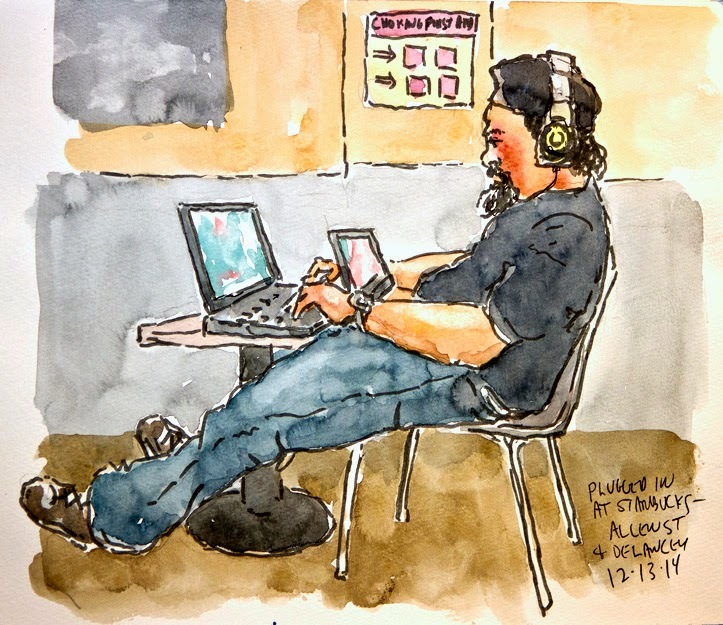 Thanks Urban Sketchers for the opportunity to enjoy the camaraderie of a talented group of artists! Very nice work, Jeff. 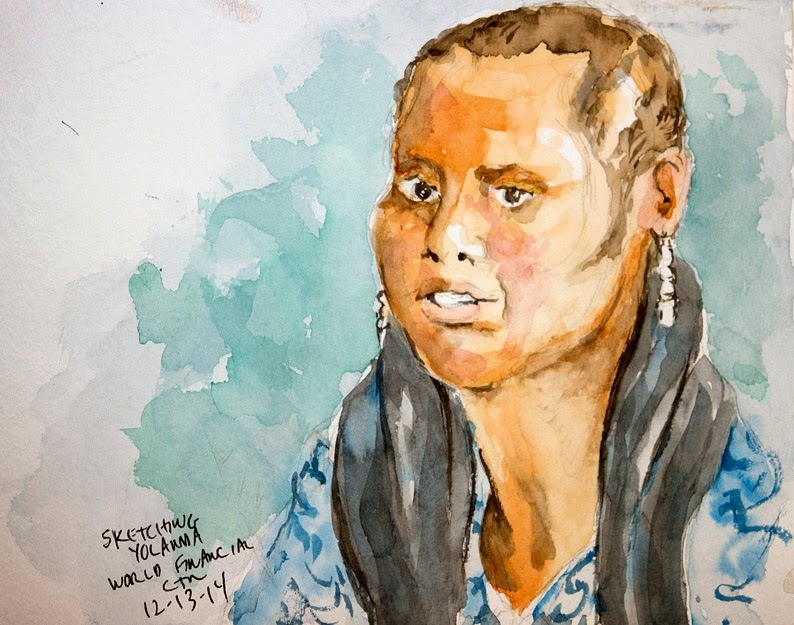 I especially like the portrait of Yolanda. The skin tones are beautiful.